1This book is the summary of a training day on digital identity1. An initial version was produced by five students – Orlane Bech, Aude Creusé, Caroline Rebmann, Célia Ringeval and Audrey Sarrazin – as part of a book workshop run by the La Roche-sur-Yon Information and Communication university technical diploma, led by associate lecturer Marijo Pateau, which has now been expanded on the occasion of this publication by OpenEdition Press. 2The aim of this book is not to discuss technical, legal or regulatory issues, nor to go into the detail of the norms, protocols and bills surrounding this subject. Instead it aims to provide an accessible overview so that every one of us can gain or regain control over our online identity and digital presence. Researchers and readers wishing to find out more can consult an extensive literature review at the end of the book, which covers all the issues raised throughout the text2. The main difficulty for such a book is the speed of change in this field. The author has therefore chosen to stick to the “fundamentals” when it comes to the creation and management of – and issues associated with – our digital identities. 1 The slideshow from the training day is available at the following address: http://fr.slideshare.net/olivier/identite-numerique-3973604. 2 In addition, the author monitors and publishes developments in this area using Diigo: http://www.diigo.com/user/affordanceinfo. ERTZSCHEID, Olivier. 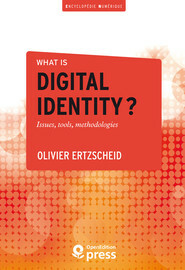 Foreword In : What is digital identity? Issues, tools, methodologies [en ligne]. Marseille : OpenEdition Press, 2016 (généré le 24 avril 2019). Disponible sur Internet : <http://books.openedition.org/oep/1388?mobile=1>. ISBN : 9782821855793. DOI : 10.4000/books.oep.1388. Ertzscheid, Olivier. “Foreword”. What is digital identity? Issues, tools, methodologies. By Ertzscheid. Marseille : OpenEdition Press, 2016. Web. <http://books.openedition.org/oep/1388?mobile=1>.